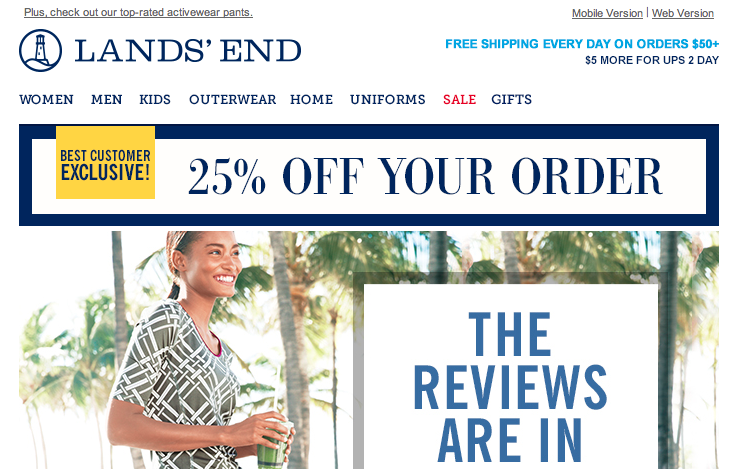 Two emails from Land’s End this morning. One to the email address I’d been using for 20 years; the other to the new one I attempted to switch my account to. The content of the body of the emails is identical, except for the amount of the discount. We invite companies to advertise to us when we sign up for alerts on their websites, or make purchases and don’t opt out of promotional messages. What an incredible opportunity we give those advertisers. Just don’t try to change your email address or you’ll mess them up. Changing your email address usually isn’t a simple process. Most emails give you an “unsubscribe” option; few give you a clear option to change your address. If you succeed in navigating to a “My account” or “Manage your account/preferences” screen, you then generally have to burrow through to the screen where you can edit your contact information. More often than not your old email address remains in the system anyway. Changing your email address doesn’t unsubscribe the old one. I’m singling out Land’s End because it’s such a clear example, but it’s a common problem. In fact, I’ve been a Land’s End fan ever since I was ordering pants by phone (so we’re talking a long time ago) and the rep said, “Mr. Mayer, I understand that you may need a wider waist, but have you grown since your last order?” We both laughed, and I asked what inseam I’d ordered last time. Indeed, the sales rep was on the case, and I would have had to return the order. She earned her commission — and my loyalty.